WOODEN: A LIFETIME OF OBSERVATIONS AND REFLECTIONS ON AND OFF THE COURT (McGraw-Hill). Preparing for Success means you must work hard. Are you preparing to Succeed or preparing to fail? If you are looking for the easy way, a short cut or trick you are preparing to fail because success requires old-fashioned hard work. Remember: Only you know if you are working as hard as you can. You have to like what you're doing to do what you like at your highest level. Your heart must be in it. Without Enthusiasm you can't achieve your fullest potential. Hard Work combined with Enthusiasm is your powerful engine. To make a friend you must be a friend. Friends are your family, teammates, classmates and workmates. They help you succeed and achieve your goals. Friendship is mutual. It is not a one way street. Good friends do good things for each other. Strive to be reliable and dependable. Keep your word by doing what you say you will do. When you have Loyalty others will be loyal to you! It means giving respect to those you work with. Respect helps produce Loyalty. Working together with others requires teamwork. If you wish to be heard, listen. Cooperation means working together in all ways to accomplish the common goal. It also allows individuals to move forward together instead of going off in different directions. Two horses pulling a wagon must move in the same direction or the wagon does not move. Discipline yourself so others don’t have to do it for you! Be in control of how you behave. Good judgment requires Self-Control of your feelings. Bad judgment comes from poor Self-Control. How can you perform at your best when you are using bad judgment? Pay attention to everything that is going on around you all the time. Listen with your ears and your eyes. Listen with your nose! Your hands. Don’t fall asleep on the job. Always be ‘listening and learning’ and you’ll be heading to success. Do not sit on your hands doing nothing. Instead raise your hand and then speak up. Do not be afraid to fail. Instead be afraid of failing to act! If you are afraid to act because you fear failure you will never do the things you are capable of doing. Success takes lots of time and will bring lots of set-backs. Don’t quit; don’t back down; keep trying time and time again! You may have to start over. You may have to go around, or over, or under. But do not quit. Stay the course. Quitters will not succeed because success takes lots of Determination. Be good at what you do! Learn the subject! Master the task whether its geography or gymnastics. You have to know what you’re doing and be able to do it quickly and properly. To improve your level of Skill takes practice, study, and repetition, repetition, repetition. When you are part of a team always remember that your job is to do what will help your teammates achieve success. The goals of your team come first. Figure out how you can help your team do its best. Who you are is a gift, so be yourself! Do not act or pretend to be something you’re not. When you are yourself and make the effort – 100% – to be the best you can be you are a success. Your goal is not to satisfy the expectations of others but to satisfy your own expectation. So set them high! Give your total effort to becoming the best you are capable of being. It takes Poise to accomplish this. Have faith in yourself and what you can achieve. Poise and Confidence are achieved with proper preparation: The Pyramid of Success! Every block is built with the others. When all are in place, Poise and Confidence result. They happen naturally from proper preparation. You have achieved the highest kind of Success when you have made the effort – 100% – to do the best you can do. You and only you determine whether you achieve Success: Peace of mind knowing you made the effort – 100% – to do the best you can do! Legendary coach and teacher John Wooden believed and taught that the most important responsibility each of us had to ourselves was to do everything we could to achieve our own potential. Here is the synopsis of how he came to that belief and how he taught it. John Wooden, one of America’s most respected coaches and teachers, began his career shortly after graduating with honors from Purdue University in West Lafayette, Indiana. Teaching English and coaching basketball at Dayton (Ky) High School, he soon became frustrated with the conventional A, B, C grading system that was in place there and elsewhere. Mr. Wooden believed that while this format had value, an even more valuable and productive system would define the quality of effort made by a student to achieve his or her own potential as the highest priority. His dad’s message? What counted most, even more than a grade or the score, was how hard you worked – how well you prepared – to do your best in striving to reach your own unique potential whether it’s for an English test, a basketball game, or life. 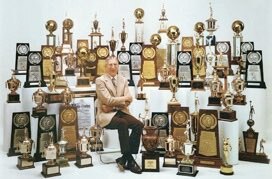 For John Wooden, effort was the starting point for Success. In 1934, after much thought, he wrote down his definition of Success – peace of mind which is a direct result of self-satisfaction in knowing you made the effort to become the best you are capable of becoming. He wanted to develop a self-grading system that was both fair and productive, something that went beyond getting an A in class or scoring points on the court. Soon he realized that as a teacher and coach you couldn’t just tell a student or player what to do, you needed to TEACH them HOW to do it, how to use good mechanics on a jump shot, or how to get an A in class, you needed to show them HOW to get there, how to do it right. That’s when he began a lengthy search for the personal characteristics and qualities that would best enable someone to achieve Success as he defined it. At Dayton, and later at South Bend Central High School and Indiana State Teachers College, Mr. Wooden worked on identifying those values he viewed as fundamental when it came to preparation and personal achievement as it related to one’s effort. He was very serious about it: it took fourteen years. Then in 1948, shortly before he was hired by UCLA and gained attention as one of America’s greatest coaches and teachers, he completed his work. He called it the Pyramid of Success and it contained fifteen building blocks – behavioral traits – Mr. Wooden viewed as essential characteristics for achieving success. Each building block in the Pyramid of Success had unique importance as did the order of their placement. He started with the cornerstones (Hard Work and Enthusiasm) and built up to the apex where he defined the goal: Success – peace of mind which is a direct result of self-satisfaction in knowing you made the effort to become the best you are capable of becoming. its foundation; then ascending tiers containing such necessary traits as Self-Control, Alertness, Action, and Determination. In the center of the Pyramid he placed Fitness and Team Spirit. All of these, ultimately, lead up to Poise and Confidence within the student who has prepared properly by using the building blocks of the Pyramid of Success. The first twelve blocks are qualities we can essentially acquire simply by trying. The top three blocks RESULT from acquiring what sits below them, a consequence of those supporting twelve blocks. You can’t will yourself to have Poise and Confidence and Your Personal Best, they are given to you when you acquire personally the first twelve blocks as fundamental components of who you are. Mr. 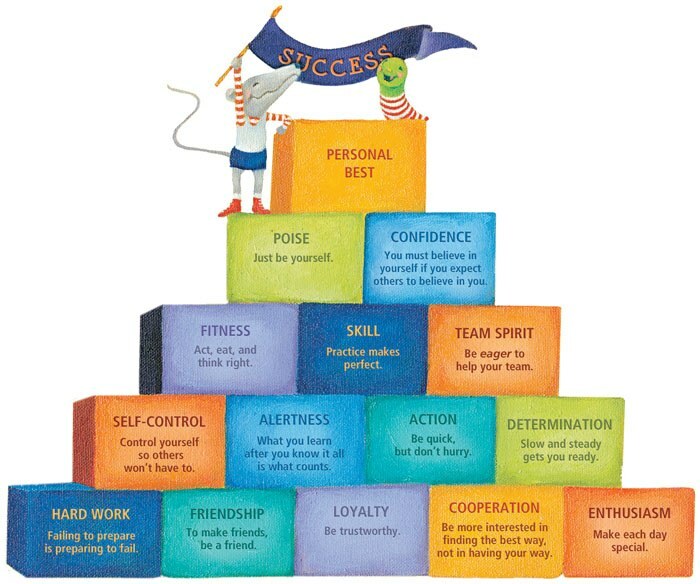 Wooden taught his students and student-athletes that the goal is to achieve your personal best and that incorporating the building blocks of the Pyramid would help them to do it because it created good habits. He offered the Pyramid and his definition of Success as a guide, stepping stones to help young people understand what it really takes to make the effort – 100% – to fulfill their potential and do their best. In a nutshell, this explains the origins of John Wooden’s Pyramid of Success – a time-tested teaching tool helping youngsters become the best of which they are capable of becoming. Mr. Wooden viewed striving with all you’ve got to achieve your own potential as a fundamental responsibility that each of us has to ourself. Legendary basketball Coach John Wooden coached basketball at UCLA from 1948 to 1975 where he won a record 10 NCAA championships (including an unprecedented seven in a row). In addition to being inducted into the Basketball Hall of Fame and the College Basketball Hall of Fame, Coach Wooden is also a recipient of the Presidential Medal of Freedom.